A mother has filed a lawsuit after a teacher allegedly had a friend help her beat a student with a belt. NBC 5's Chris Hush reports. Warning: Details are graphic and may be disturbing for some readers. 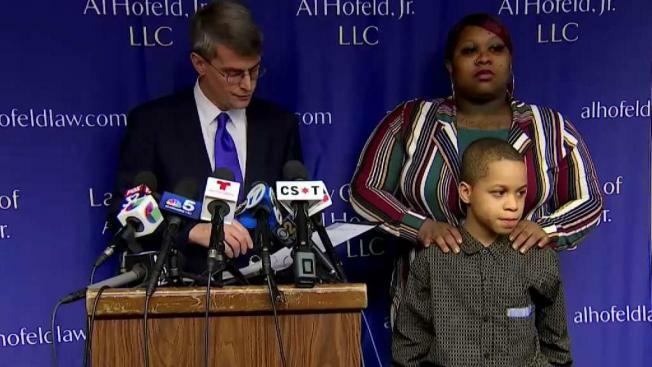 A 9-year-old boy was dragged from his Chicago Public Schools classroom and beaten with belts in a bathroom by his fourth-grade teacher’s friend this school year, according to a civil rights complaint filed in federal court Thursday. The complaint alleges that on Sept. 20, 2018, Jomaury Champ attempted to enter his classroom at George W. Tilton Elementary School in the Garlfield Park neighborhood when his teacher Kristen Haynes and her childhood friend Juanita Tyler "physically accosted" him. Tyler allegedly slapped Jomaury twice before she and Haynes dragged him by his wrists down a hallway to the second floor bathroom, the complaint states. There, Haynes is accused of leaving Jomaury alone with Tyler and walked back to her classroom as the child was beaten with belts. Jomaury, who attorneys said had no significant history of discipline or behavior problems, was beaten with two large belts 20-30 times on the back, legs and buttocks "breaking the skin and leaving abrasions and red marks on his left, right inner thigh and buttocks," the complaint states. According to the complaint, Jomaury sobbed while pleading for his mother as Tyler shouted "I am your mama." She then brought Jomaury back to Haynes’ classroom and handed the belts back to Haynes as Jomaury sat at his desk and sobbed for hours in front of classmates, the complaint states. Haynes then allegedly threatened Jomaury by saying "You better be good because the lady is going to come back up at 1 p.m."
Haynes, 50, was arrested on Sept. 24 and charged by police with battery and causing a child to be endangered. Tyler, 56, was arrested on Sept. 28 and charged with domestic battery causing bodily harm, according to Chicago police. Chicago Public Schools said Haynes is no longer teaching at the school as an investigation remains ongoing. "Every student deserves a safe learning environment and the district will not tolerate actions that place students in the way of harm,” the district said in a statement released Thursday. “After learning of deeply concerning allegations, the district removed the employee from her position and launched a full investigation. While the investigation remains ongoing, the district is working directly with the school to ensure support is available for the student and family." The district noted it will take additional disciplinary action pending the outcome of the investigation. Jomaury’s mother, Asia Gaines, first learned of what happened around 4 p.m. that day, after her sister picked Jomaury up from school. The boy also called to tell his father what happened, the family’s attorney said. “Jomaury’s parents are outraged that someone had touched and beaten her child, outraged that his teacher had allowed a total stranger to beat him, and outraged that that they were never contacted before or after the incident,” a release from Attorney Al Hofeld Jr. read. The day before the incident, Hofeld said Haynes called Jomaury’s father to tell him the boy “was playing around, had an attitude, and folded his arms when Haynes spoke to him.” The child had previously been sent to the principal’s office because he forgot to hang his backpack on the hook in the classroom, Hofeld said. According to the complaint, Jomaury has since been diagnosed with post-traumatic stress syndrome and other trauma-related disorders. He was partially hospitalized for more than two months and now takes medications for anxiety, insomnia and receives weekly psychotherapy. Hofeld alleges Haynes had a history of “punishing her students with belts” and said Tyler had previous child endangerment and domestic battery charges. Tyler is a distant relative of Jomaury’s whom he may have met one time, Hofeld said, though she was not listed as an emergency contact. It was not immediately clear if Haynes or Tyler had attorneys.